House Republicans have released their long-awaited tax giveaway plan. It’s as bad as those of us who have been resisting the Trump administration and Republican efforts to hijack our economy and democracy have long feared it would be. People’s Action joins Americans for Tax Fairness and a broad range of organizations in the “Not One Penny” campaign to ask everyone to call this number – 877-795-7862 – and tell their Members of Congress to vote against this tax plan. “Don’t be fooled, the Trump, GOP tax plan is one more attack on health care that puts working families, the elderly, poor and children at risk while padding the pockets of the one percent and wealthy corporations,” said LeeAnn Hall, co-executive director of People’s Action. The GOP’s tax plan takes advantage of last week’s passage of a horrific budget resolution to set the stage for a $2 trillion tax giveaway over 10 years, 80 percent of which would land in the pockets of the top 1 percent of taxpayers. While this fact sheet from the Republicans on the House Ways and Means Committee denies that this is true, it does not offer its own calculation of what percentage of its tax breaks would go to the top one percent. These tax breaks will come at a steep cost to the families of working and retired Americans: $470 billion from Medicare, and $1.3 trillion from Medicaid and other health care programs over the next 10 years, plus trillions more in that period stolen from a broad range of support services for workers, families and retirees – everything from nutrition assistance to education and job training programs. The argument is simple. As Sen. Elizabeth Warren put it, congressional Republican leaders have signed off on a plan that would increase the federal deficit in order to “give away $2 trillion to giant corporations.” The bill would do that by lowering the statutory top tax rate from 39.5 perecent to 20 percent – below the global average of 34 countries in the Organization for Economic Co-operation and Development. If the Republicans want to spend $2 trillion, how about investing in roads and bridges and infrastructure? How about investing in the things that create good jobs right here in America? How about wiping out some of this student loan debt?… How about cheaper health care for millions of Americans? “This is tax reform for the Koch brothers and the other billionaires in the country. This is a disaster for the working families of America,” said Sen. Bernie Sanders of Vermont. Rep. Pramila Jayapal, who has a seat on the House Budget Committee, had tried to get an amendment inserted into the House budget bill that would prohibit any of the tax benefits in the tax bill from going to the top one percent. Needless to say, that amendment was blocked. Jayapal believes that congressional Republicans have a clear agenda. “Number one on their agenda is a massive transfer of wealth. Number two, drive up the deficit. Number three, make sure they can cut spending even more than they are proposing,” she said. On that latter point, several conservative Republicans have been openly promising even harsher cuts in the programs poor and working-class Americans depend on for support in next year’s budget discussions. As for the argument that the tax breaks the Republicans are proposing for the wealthiest Americans and big corporations will unleash a wave of economic growth that will benefit ordinary Americans, a chorus of voices are pointing out how history debunks that claim. You can very easily go to bls.gov, which is the website of the Bureau of Labor Statistics, and look up real median wages and you can see what happened after the Tax Reform Act of 1986 [the Reagan tax cut], which lowered the tax rate on corporations from 46 percent to 34 percent. And if you look at what happened to wages in the 10 years after 1986, wages fell. They did not go up. They fell. Workers were worse off. Robert Borosage wrote this week that one key feature of the GOP’s tax bill – “repatriation,” a a deep tax cut on corporate profits hoarded overseas if they are brought back into the United States – failed to deliver the investments in jobs that were promised when the George W. Bush administration tried the same gambit. Another feature of the tax plan, he adds, would actually incentivize corporations to send more jobs and profits overseas. But one woman at the Wednesday Capitol rally did not have to reach far into history to be encouraged to speak out against this new tax plan. Sarah LaFrentz is a resident of Kansas, and explained what happened when that state’s governor, archconservative Republican Sam Brownback, pursued a tax cut plan similar to the one the Republicans seek to impose on the country. The results have been devastating: slow economic growth coupled with severe cutbacks in education spending and other vital services. Privatization initiatives spurred on and justified by spending cuts have often led to calamitous results, such as news in October that the companies running the state’s foster care system lost track of 70 children. “I am here today to implore you to learn from Kansas,” LaFrentz said. If we don’t act now, what conservatives once called the Kansas experiment will become the American nightmare. 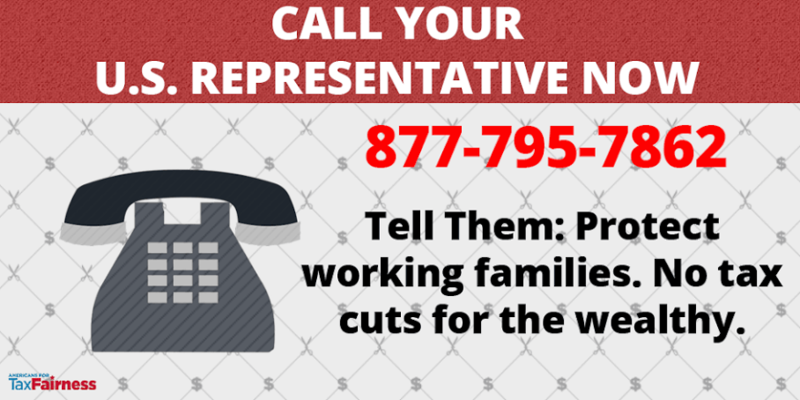 Call 877-795-7862 and tell Congress we can’t let the multinational corporations and the 1 percent get away with this tax heist.